I believe the instrument is called a “sheng” 笙, and you often see it in the small orchestra ensembles that accompany regional forms of Chinese opera. Dude’s playing a sheng 笙. That’d be a cool skill to pick up. It looks like a sheng to me. They are cool, indeed. What about just waiting for him to finish and asking him? 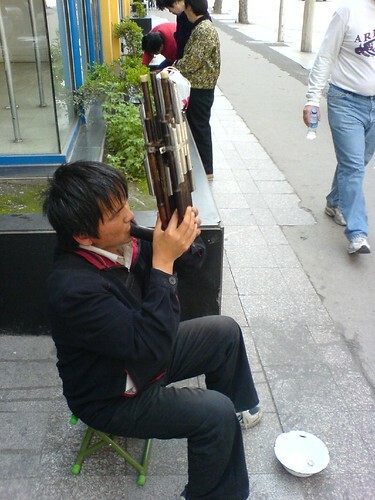 It’s the traditional mouth organ, as used in Confucian ritual music. Rather awkward to play, I found. in this case I think you’re ok: he is placing himself in the public eye as a performer, so he has to expect that people may photograph him. Kudos to you for throwng him a bone, though. I’ve seen that instrument before and have always been curious as to its name. Hopefully someone can clear this up. It’s a sheng. I heard one being played at a Chinese orchestra concert recently. It was awesome. Good question about the photography. I’ve run into problems before and have also struggled with the ethics of it. However, I honestly just don’t care anymore and take pictures as I please. If someone gets angry with me I stop taking pictures around them. I usually don’t ask first. If I’m a jackass because of this then so be it. CLICKS – One evening a while back I was watching a sobriety stop. It was a kinda of carnival of Chinese’esque ineptitude and yet, well maybe it works here. The checkpoint was just at the end of the road of the main local strip of restaurants. It’s different in the bigger Chinese cities where people drive quite fast, here locally, in this smaller city, although many people drive after drinking, the speeds are extremely slow, something like 10-20 mph. There are lots of fender benders, but few major injury accidents within town, at least that I have seen. With that said, it seemed the local police had gotten new handheld breathalizers and were a bit gung ho. They were pulling people over, teaching them how to blow into the little device, and I’m finally at my point for bringing all this up. They were filming! I’m pretty sure there were two reasons, one as a record (valid) and the other was going to be the news story video (ethical??) that I’m sure would appear soon. The video-ographer was not wearing any official police uniform, neither was her boss giving her instructions. People weren’t asked if they could be videoed, and several people turned around and/or complained. One lady was obviously not drunk, and was being videotaped. She really put up a struggle. I could just see it, next day, gossip all around the apt block about seeing Sally drunk on the evening news. I would say it’s important to consider how the person being photographed would react. In general I think that a performer as such we can generally safely assume doesn’t mind being photographed, or may request some gratuity. It would be respectful to not photograph them if they did not want to be photographed, or if they requested a gratuity and you didn’t want to pay them. I don’t think giving a gratuity post comes to much into it. When a tourist it’s often unknown to us how locals might feel about being photographed. I once wanted to take a photograph of an old Shanghainese lady. She vehemently objected. I didn’t know if she was just be modest. I tried to convince her, and in fact someone nearby also said, why not granny. She kept saying no. So I didn’t take the shot. The light was soooo good. In John’s case, since you do speak Chinese, what stopped you from simply asking him pre or post photo? You could have just said, ‘Hey, I took your photo! You play great, what’s that instrument’ and guage his reaction. He wasn’t far away. If he said ‘no no, my spirit will be taken away…unless you give me 100 kuai’, well you could delete the shot. It is digital, not like you’re wasting film. In contrast, I think Kevin has wandered into a place probably over the line, because I get the feeling from his comment that for many shots, he knows the subject wouldn’t like the shot. And he’s got no overarching journalistic for the public good to balance things out a bit. It would be like going into a Buddhist Temple, ignoring the no photography signs, knowing full well no photography is allowed, and snapping away until an attendant comes over to tell him to stop. I’d bust his camera and claim sorry my arm just swung wildly and randomly struck the camera. Ethics I think is a human characteristic of being able to not do what we know we shouldn’t, although we could. In Yuanyang in southern Yunnan all the kids have learned that if somebody takes their picture they should immediately ask for money (照相要给钱!). In these instances I think tourist photography has a bad effect on the locals, and must in some way negatively affect how they see themselves/value themselves in relation to the wealthy tourists coming through their villages and homes. Personally I’ve decided to stop taking pictures of people in these communities. It just always leaves me with a bad feeling, and I’m reminded how I feel when Chinese snap pictures of me while I’m walking down the street, or eating by myself in a restaurant. In this instance I agree with Prince Roy though–there should be no problem taking pictures of entertainers in a public setting. @KMM: I agree. I hate going anywhere touristy where there might be a class trip on. Nothing clutters up an already cluttered trip to a Chinese tourist attraction than becoming the attraction yourself – putting it in the reverse is well said. @Lantian: I see where Kevin’s coming from and I do think it’s considerably different than places that specifically call for no photos (such as a temple), but you have an excellent point overall about ethics and I think that’s what it comes down to. If the photo is likely to exploit the subject, then you need to carefully consider what you are doing. If it’s just some random person on the street that you want to have a photo of to remember the moment… not much harm. This is a false analogy. Taking pictures when it is expressly not allowed is not analogous to taking pictures when it would just make people angry. However, you are right, Lantian, in that I will take a shot even if I know the subject probably won’t like it, but I’ll stop if the person asks me to or starts to get angry. This comment doesn’t make you sound like a very ethical person. While it’s possible he was able to hear the clink of 5RMB and the “click” of your camera, it couldn’t be too hard to ask quickly if he minded. You can’t make assumptions just because he’s blind and entertaining on the street. Thanks for the instrument ID, everyone. Good to know. As for the ethical question… I didn’t want to ask him because he was in the middle of playing, and he was totally absorbed. The thing was pretty loud; I doubt he heard my camera taking a picture or the sound of a paper 5 RMB bill falling into the bowl. In my travels, I tended to take an approach similar to kmm’s. If always carrying my camera around was constantly leading to ethical dilemmas, it was a lot easier to just enjoy the experience if I quit taking pictures most of the time. It all comes down to this: am I traveling in order to capture it all with my camera and share/relive it later, or am I doing it for the experience now? I chose the latter, and for me that meant less photography. If it’s in public, it’s fair game. Hi Kevin S., I was just kidding about the busting up of the camera, trying to make a point. I think that ethics comes down to what a person-themselves feels is right and what ‘social contract’ they’ve signed up with. Rules and laws and such in a society are guidelines and I guess in essence allow punishment and consequences. When one breaks ‘ethics’ really there are no consequences. I have a friend who likes to say, she’d be a pretty bad person if there weren’t laws to stop her! My analogy with the temple I still think is good b/c like you said, sometimes you know the subject doesn’t want their photo taken. In essence you know they have a ‘Don’t take a photo of me’ sign above their head. If you ignore or break that implicit/explicit agreement, kinda seems fair to me to go eye-for-an-eye. But most laws around the world preclude me from that…haha so yah, maybe I’m not too ethical either. To me, ethics is about minimizing suffering. If a person does not know he/she is being photographed under general circumstances, no suffering is caused. I cannot see any ethical dilemma. If a person becomes angry at being photographed, or if there’s a potential for violation of privacy (ie. not in public) then the situation is different. Of course, I also subscribe to the theory that says the ethical dillemmas related to photography are inversely proportional to the enthusiasm of the photographer for his hobby. I live in Shenzhen and there are always people playing the sheng at my bus stop… I think it sounds like strange funeral music, but somehow I like it. But, I also think that it is ok to take the picture since he is performing in public, no problem there. However, if the beggar did happen to take a break right when taking the photo, maybe it would be a good idea to ask first. Why are you so certain he didn’t know his picture was being taken? Looks like you were pretty darn close. It all comes down to this: am I traveling in order to capture it all with my camera and share/relive it later, or am I doing it for the experience now? I chose the latter, and for me that meant less photography. You have to find that happy-medium. I’ve taken trips where I spent more time looking through a view finder than looking with my own eyes and regretted it. I’ve taken other trips where I specifically took less or no photos and regretted that later on. It’s a personal decision that is likely to be different from person to person. IMHO I think you were okay taking his picture. Like PR said the guy is a performer and he didn’t voice any complaints, even if he didn’t know you were taking his picture. That doesn’t fly everywhere though. There are plenty of performers in NYC and in Rome (dressed up like gladiators) that get very pissed if you take their picture without paying them. I think it should be acceptable to take a picture of someone unless there’s a chance they will be offended by it, either by having noticed you take it, or discover the picture later. The benefit of taking the photo then should have to outweigh the chance of it being discovered, that is, the enjoyment & enlightenment we receive from the photo should have to outweigh however much that person (or their friends & family) might be upset, mitigated by how likely that would be to happen. Consider those famous photos from Vietnam – the drill sergeant screaming at the soldier, spit flying from his face, or the naked girl running down the street after a firebombing in Vietnam. Both photos were undoubtedly deeply embarrassing to the subjects, but they did reveal the nature of the Vietnam war and brought tens of thousands of people to the anti-war cause and stand today as a reminder of the horrors of war. This certainly outweighs the embarrassment they’d feel; building up an intolerance for further bloodshed was an important consequence of creating these symbols. Wow, five whole RMB. That’s like what now? 60 cents?